Happy Thanksgiving everyone! Hope you had a wonderful holiday and were able to enjoy time with friends and family. Husband was in California for his great uncles funeral (sad for the loss) so we were apart for Thanksgiving - we have yet to spend a T-day together (course there have only been two opportunities). I missed him a lot - wore his sweatpants and stayed up late so I wouldn't have to go to bed alone (oh, I'm ridiculous!). My parents came into town and it was wonderful! We had 32 people, 4 dogs, 3 turkey's, 3 stuffings, 3 sweet potatos, 2 green been casseroles, 19 pies, and a lot of fun! My parents brought over their dogs - a collie (Dotty) and a German Shepard (Fletcher) - Stella and Fletcher had so much fun together and were very entertaining since he is at least 20 times her size! I also made myself very busy crafting a decorating my house for Christmas! I am beyond excited for husband to come home and see it!! 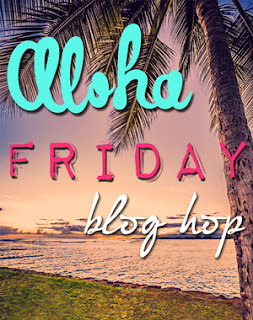 Well, there's my quick update, now here is the Aloha Friday Blog Hop! Don't miss out on our giveaway below!!! Katie from Life in the Simple Lane!! 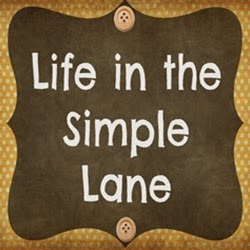 Katie's blog mission is to spread her message of simplicity to the far corners of the world. If something is worth doing at all it is worth doing simply :) Want a little taste of her ideas? Check out these posts to find out what you've been missing: Simple Beauty Tips for Moms on the Run - invaluable, even if you're not a mom! Timesaving Tips - clever stuff here people. If you're not already a follower than you definitely should be! 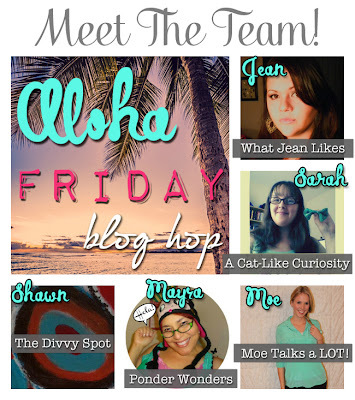 Now, let's link up and start spreading that Aloha shall we? Now for the NOVEMBER GIVEAWAY! !